Rich Colombians see themselves as English. Colombian intellectuals see themselves as French. The Colombian Middle Classes aspire to be American. And the poor see themselves as Mexican. 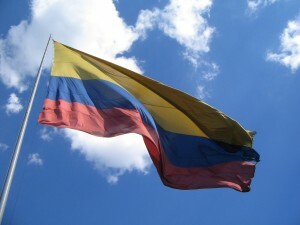 Then he added, But I’ve learned to be proud of being Colombian. The history of Colombia is, from the historical point of view, the indefinite postponement of necessary changes, in the state’s institutions as well as in social structures and in the behaviour of the participants. My husband had a work colleague who was a Christian who used to give him tracts which my husband would give to me. Then I started going to church and was overwhelmed by how kind and friendly the people were, you could say I fell in love there and then. I kept inviting my husband to church but he didn’t want to go. One Easter I invited him again and he said no. So I went into the bedroom and prayed and when I came out he had tears in his eyes – he was watching something on TV – and he said “Get my clothes ready, I´m coming with you,” and he became a Christian that night. As Colombia wrestles with the difficulty of establishing peace with justice, the caption on a cartoon in a recent Semana magazine expresses a bitter truth, that many, perhaps even most participants in the conflict will not face human justice. The problem is that if transitional justice is meted out to the guerrilla and the paramilitaries and the politicians, the judges and the paymasters and the accomplices and the other actors and all the direct and indirect protagonists of the conflict…the only people left in prison will be us poor people. I was in Glasgow when six people were killed in a tragic accident in the city centre just before Christmas. I was struck and touched by the outpouring of public support and grief but couldn’t help comparing the Scottish reaction with what happens in Colombia. If the Colombian public were to mobilize itself to empathize wholeheartedly with every incident with multiple victims it would have to do it every day. Today in Colombia 3 people died in a bus crash, last week 3 soldiers died in a minefield and a mother killed her 3 children and tried to kill herself, in January four children aged 4 to 17 were executed by hit men sent to kill their parents, last year 32 children died in a bus fire. Finding a way to keep a compassionate heart without being overwhelmed with grief every time there is a tragedy is the great challenge of living here. News this week of the capture of a criminal who got up early to steal from commuters on Bogotá’s Transmilenio transport system. For several months he was getting up at 4am to start his nefarious activities. His nickname was The Cockerel. I’m reading a fascinating book called Pa’ Que Acabe la Vaina by a Colombian author called William Ospina. It’s a sort of history and social commentary of Colombia and Ospina is very clear where the blame for Colombia’s fractured reality should lie: with its leaders. All those efforts to find who is guilty of our plagues avoid the central problem: who pushed the guerrilla into the insurgency, the criminals into crime, the poor into poverty, the mafiosi into trafficking, the paramilitaries into combat, the assassins into their grubby trade, if not a way of governing the country which shuts the doors to all who do not belong to the order of the chosen few. On the metro there are young men in uniforms who are completing their military service. Part of their job is to make sure that people who need a seat, get one. So if someone who is old or pregnant or carrying a child or on crutches needs to get on a train, the young man will step in to the compartment ahead of them and announce that someone needs a seat and wait until someone gets up (and someone always will) so the person gets to sit down. Me: So how is it going? Taxi Driver: Wonderful. You know, I have a very rich Father and he is very generous to me. Taxi Driver: Yes, it’s God. He’s so good to me. Look, today I’ve already made the $80,000 I need to make to pay the owner of the taxi. And I always make a good $50,000 on top and I pay all my bills. I’ve just taken my wife shopping. Oh, I am very blessed. I am Catholic but I am very respectful of Evangelicals – the real one, not the 11-month ones – the ones who are good all year and then have a big blow out in December.